My horse story isn’t the average story. It isn’t the repetitive story of a jumper who refused the jump or an accident during the show or the old horse that finally died or the “she was the greatest horse in the world” story. My story is different. All my life, I have had a way of looking at things that was different than most. I like to think, that if God has a plan for all of us, he has intentionally put me with horses from the start. We have a connection that only we understand. Something just binds us together, as if they are a part of me. 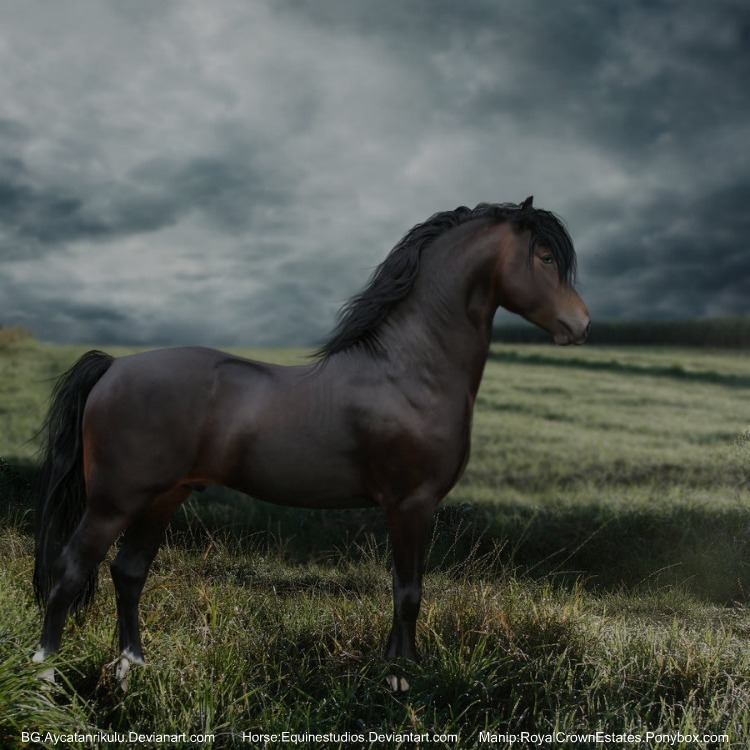 It is not just my own horse that is a part of me, all horses call to me. It's like we share the same wild spirit. This couldn't be just an accident. Like all first horses, my first horse was very special to me. It's that moment you see her, you just want her. There’s a strong feeling that just drew me towards her. 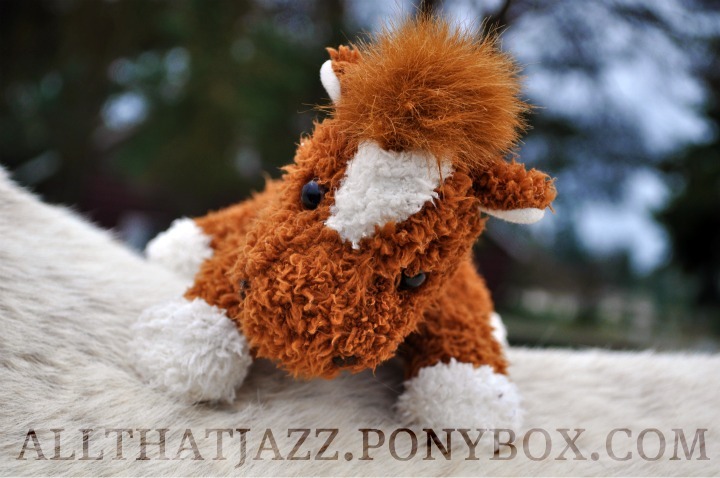 I just wanted to squeeze her tight and bury my face in her patchy chestnut coat. I didn't care if she wasn't beautiful, in my little 7 year old eyes, she was mine. I didn't care that she was muddy and un-groomed. She was all mine. The second she was home I was all over that horse, brushing her with every brush we owned. I probably couldn't tell you how many times a day I visited that horse. I would walk down to the north pasture in my pink rubber boots, up to my chin in weeds and blackberries. Handfuls and handfuls of treats were packed into the pockets of my shorts. The second I spotted May Day, my eyes lit up like a firework. I can't express the feeling without showing it to you. 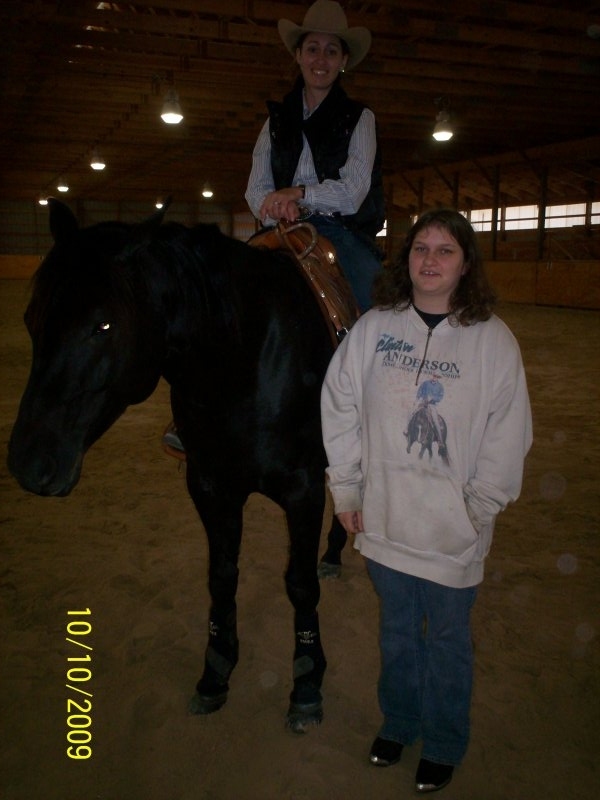 I was truly in love with that horse, and I believe she was in love with me. She would close her eyes in happiness as I ran the soft bristle brush over her sleek over-brushed coat. I would pick out every burr, sticker, and seed from her tail and comb it until it was silk. May Day became my priority in life. I thought about her day and night. In school I was practically a zombie, just counting the minutes until I would see my May Day again. As soon as I was off the bus I would run as fast as my legs would carry me down to the pasture where May waited for me. I would throw my backpack to the ground, carelessly. I pulled the crushed up treats out of my warm pocket and held them under May Day’s soft grey muzzle. She looked to me with loving eyes and ate the treats happily. That was when I got the warm fuzzy feeling of pure affection for her. It felt so good to be with her after a long day of school. May brought a certain character out of me. It wasn’t the usual, straight-laced, quiet, diligent little school girl that I acted as until 3:00. This little girl was a pure-hearted, wild spirit, born to be with equine. May was the other half of my heart, it may seem cliché. She fulfilled my dreams of living with horses, like I was a part of her herd. To May, I was. She was like a mother to me. 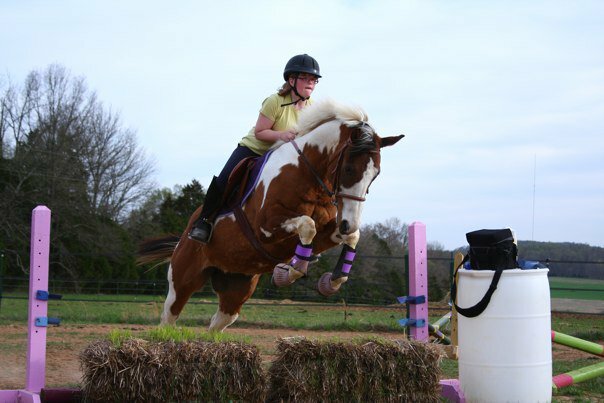 She taught me to ride, love, fall, overcome, and stay strong. Our very first show was the County Horse Show. If you can imagine, I was young and full of nerves and excitement. Sitting on May’s back made me feel big, and important. I watched the older girls in envy, sitting up tall and proud just like they did and looking all casual just like they did. I felt like a true cowgirl. This show was huge for us! But there was also huge competition. For my first year, I rode in Western Pleasure. Two classes, two anxious hearts, and one winner. The second I stepped into the fresh, sandy area, May went down. I couldn’t figure out what was going on, my leg was crushed underneath her as I struggled to get out of the way. With one yank I fell flat on my back beside her. May rolled onto her back and kicked her heels into the air. I laid on my back beside her, laughing hysterically. It seemed like we were sharing a laugh as she closed her eyes and kicked her legs out playfully. I pulled her onto her feet and stood. We were covered in sand, inside and out. Everything was dusty and uncomfortable, but I got back on and acted like nothing happened. I couldn’t help but let out another laugh as I brushed sand out of my face. I couldn’t have been happier, even if I had probably cut my chances of winning in half. We were so careless and free, even in such a tense environment. My nerves were calmed. We finished that show with second place, but I couldn’t care less. I was overly proud of May Day no matter what color the ribbon. We were going places, May and I. I had it all planned out for us, as soon as I was old enough I would take May Day to the State Horse Show and we would win first place! My heart could dream all it wanted, but things like that were unrealistic, unfortunately. Winter came, and I still saw May everyday. Late one cold winter night, May's stall was left open and she wandered out. That mare ran like there was no tomorrow, which tragically, there wasn't. She crossed the road in front of a truck and was hit. I woke up seeing bright lights outside my window. I quickly dressed up and went to see what all the commotion was. The sheriff had been called that a horse was killed in car accident. He came to us, the closest people with a horse and we knew she was ours. I just refused to accept it. My mom told me she didn't suffer, but I didn't believe her. I couldn't. I ran out with teary eyes in the middle of winter, stumbled into her stall and screamed in anger and frustration. I did everything I could to make myself think there was some way; somehow she's still alive like in the movies. I even followed her tracks around the yard. It only made me angrier and angrier. I asked God, why have you done this? You took away my best friend! What am I supposed to do now? I was angry at everything. My chest tightened up and I threw up for hours from the stress of crying. May meant the world to me, and what was I going to do now? I felt like there was no one on my side, there was NO way I would survive without her. I lived in this dark, depressing place for months. I lived in regret and anger. I didn’t think I would ever pull through without my best friend by my side. There wasn’t hope for me. A year after May's tragic death, I was beginning to move on. I knew I belonged with horses and I wasn’t going to let one accident destroy my feisty spirit. I decided that the grieving would go faster if I had someone to help me move on. Someone special, loving, understanding.... A horse. I found a good little mare with huge potential and I made the decision to buy her. I was hesitant to open my heart up to her, in fear I would loose her. So for the first few months we owned her, I tried not to become attached. It was almost impossible to live "halfway". I was so drawn to Sophie, I ended up falling for her, completely in love with her. I found that she was exactly what I needed, someone to help me overcome. Someone I could talk to and she wouldn’t talk back. Someone I could love again. Sophie was young, un-trained, and full of wild energy. I took to her like a mother, training her, feeding her, and caring for her. There were a lot of very tough times were I wanted to give up. I just wanted the easiest, least painful way out. I wanted to go back to May, who was trained and easy to ride. I wanted to push Sophie away and just get rid of her. But when I saw that mare's potential to love and open heart, I was pulled back in, once again. She pulled me through almost everything. She seemed to speak to me, even in my darkest, toughest hours. She calmed my nerves, soothed my pain, and understood me thoroughly. She was like a sister. Sophie is a fearless trail horse. She is so willing to do whatever the task is, no matter what the obstacle. 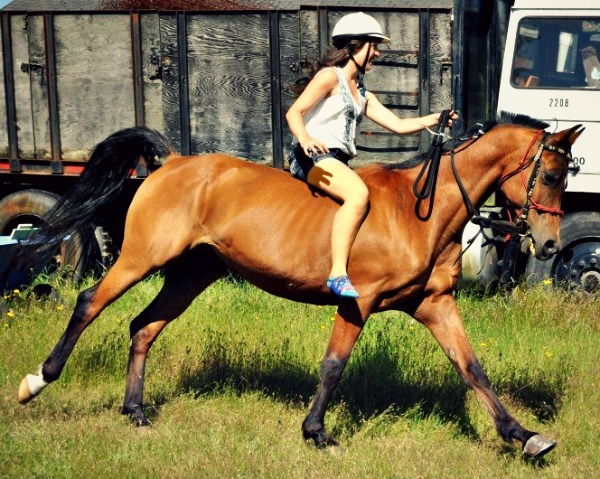 She is the perfect pleasure horse, quiet, calm, and a pleasure to ride. But this horse, let me tell you, has a completely different side to her. She’s a lot like me, straight-laced, quiet, and diligent in training, but beholds a wild, feisty spirit. I discovered this second side of her while out on a quiet, calm, evening ride. The sun was almost down and the fields were just starting to get that wet, cold, dewy look. I decided to let Sophie go, to just let her go and see where she goes. I've never ridden a horse, in all my life that ran like she did. She ran as fast as she could, free as the wind. We started at a lope, her ears flicked back to my cues, questioning them. She seemed to ask "Do you really want me to... Go?" And the second I reassured her, she took to the ground, like a bullet. Her pace lifted into a full ground-shaking gallop. Her legs snapped back and forth, reaching out in front and practically grabbing the ground and whipping it behind her. It was breath-taking to ride. I got chills up and down my spine as that little mare flew over the ground in this pure, open, wild, and free run. It was like she was somewhere else, like she could see for miles. I endured that run. The way the wind took my hair, the cold fresh air against my cheeks. I felt a heart-stopping feeling that just tingled up my spine. I felt freedom, and that’s when I realized my heart belongs to her. Nothing could change that because the heart wants what the heart wants. It made me want to cry and laugh and just scream to the heavens. It was the first time in all my life I've felt something so strong. And that's how I know I belong with her. Good things always come out of a bad situation... eventually. You just have to open your heart to it. Beautiful. Just beautiful. That is the only word that can describe this wonderful story.